Geely's China sales tumbled 47% last month, raising industry fears about the survival of China's auto brands. BEIJING (Bloomberg) -- Chinese brands will be "killed in the cradle" if the government allows foreign automakers to become more independent from their domestic partners in the world's biggest car market, the country's main auto group said. The China Association of Automobile Manufacturers voiced its warning Thursday as it reported that Chinese brands in January extended market-share losses, falling 4.9 percentage points from a year earlier to 38.4 percent, while foreign companies such as General Motors benefited from record industry sales. 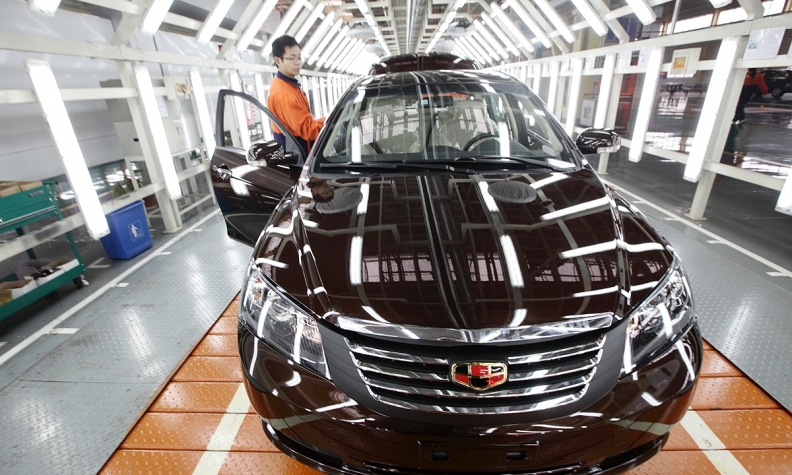 Geely Automobile Holdings alone saw deliveries tumble 47 percent. "Relaxing the current foreign ownership restrictions will wipe out Chinese brands," the state-based auto association said in a statement in Beijing. "Foreign companies can totally use the competitive advantage of their global supply chains to support a price strategy to kill Chinese brands in the cradle." The comments escalate concerns that the auto group has voiced since a Chinese commerce ministry official said at a forum in October that automakers should prepare for the day when the foreign stake limit is relaxed. Since China opened up its factory floors to foreigners decades ago, companies from GM to Volkswagen Group have poured billions of dollars to build cars in the country, as long as they set up joint ventures and kept their ownership capped at 50 percent. China's local brands, whose combined sales fell 5 percent last month, will see further declines in sales this year because they're less competitive than foreign brands in terms of quality and service, Dong Yang, secretary general at CAAM, said at Thursday's monthly briefing. Chinese brands slumped as industrywide deliveries of cars, multipurpose and SUVs climbed 7 percent to 1.8 million units last month, CAAM said. While that was a record, sales were lower than analysts estimated and grew at their slowest pace since they fell in February 2013. Growth in the world's largest auto market is slowing as anti-pollution and austerity campaigns spread. Analysts are estimating the economy this year to grow at its slowest pace in more than two decades and a Chinese manufacturing gauge in January fell to a six-month low after government efforts to rein in excessive credit. "One big negative factor is with the policies," said Xu Minfeng, an analyst at Central China Securities in Shanghai. "More and more cities are joining Beijing and Shanghai to impose restrictions on new car number plates due to air pollution and traffic congestion concerns." Total vehicle sales, including those of buses and trucks, climbed 6 percent to 2.2 million last month. Deliveries in China will rise as much as 10 percent in 2014 after last year's 14 percent growth, the auto association said last month. Volkswagen's Lavida was the best-selling sedan in the nation last month, while Great Wall Motor Co.'s Haval line once again took the top-selling SUV title. Ford Motor Co. reported deliveries surged 53 percent to 94,466 units last month after growing 49 percent and overtaking Toyota Motor Corp. as the nation's fifth-largest foreign automaker last year. The popularity of the Focus is helping Ford close in on Nissan Motor Co. and Hyundai Motor Co., which rank third and fourth, respectively, in the country. GM, which dropped to No. 2 in China last year after being outsold by Volkswagen for the first time since 2004, saw deliveries climb 12 percent to a record 348,061 units. Volkswagen, which owns brands ranging from Skoda to Lamborghini, reported Friday that group sales in China increase 16 percent to 298,300 vehicles last month. Toyota and Honda Motor Co. extended their gains last month, seeing deliveries rise 18 percent and 34 percent, respectively, as Japanese automakers continue to recover from a consumer backlash triggered by territorial disputes between Asia's two biggest economies. The outlier was Nissan, which saw a drop. Among Chinese automakers, Geely, whose parent owns Volvo Car Corp., stood out after reporting a 47 percent drop in January sales. The company cited the Lunar New Year holiday, a shake-up at its sales and marketing system, and slumping exports for the drop. Geely saw a "complete collapse" in wholesale deliveries last month, Max Warburton, an analyst at Sanford C. Bernstein & Co., wrote in a note this week. "Some of the local brands will definitely be wiped out very quickly if the foreign ownership restrictions are relaxed," said Yale Zhang, managing director of Autoforesight Shanghai Co. "They shall have to learn to depend on themselves."